ID: 307 ~ Source: Image courtesy of the Scottsdale Public Library. 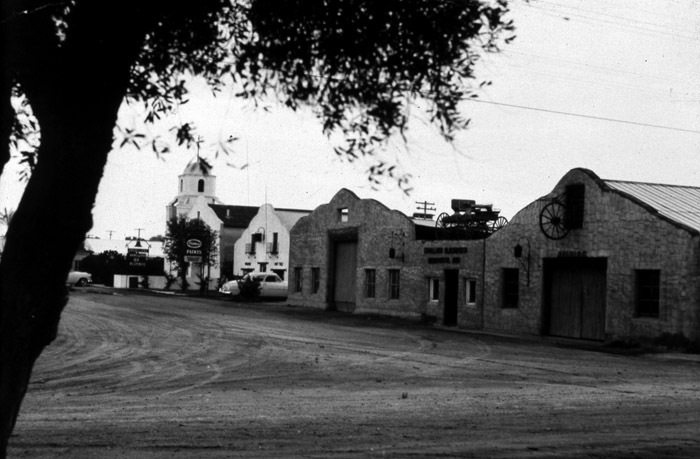 This undated photo shows buildings on the east side of North Brown Ave in Scottsdale. Once considered to be on the outskirts of town, the dark building at the far right is part of Cavalliere's Blacksmith Shop, and on the left is the mission-style bell tower of Our Lady of Perpetual Help Mission Church. Both of these building are on Scottsdale's Historic Register.